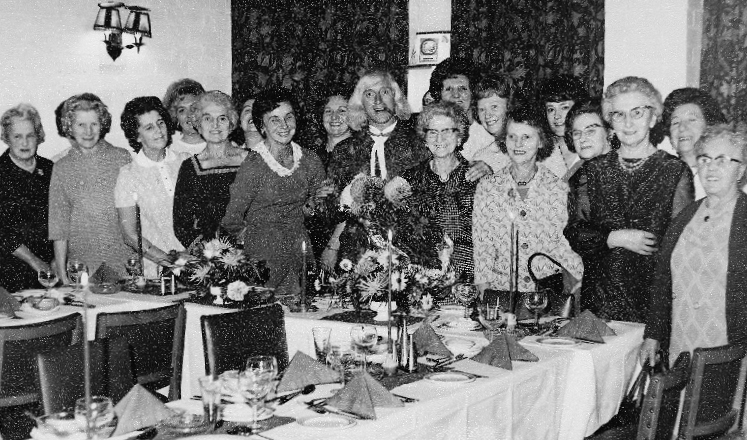 The Woodlesford Widows Association with Jimmy Savile in November 1970. Elsie Whittaker is third from the left. The occasion was the group’s first anniversary dinner held at the Quebec Restaurant in Leeds. Jimmy, who was dressed in a blue suede flowered suit, brought along his mother and joked that the 22 widows in the group were his “wives.” He also kissed all of them on the hand. 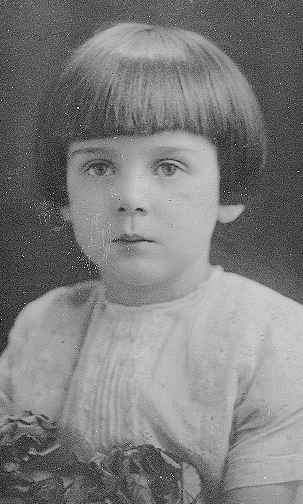 Elsie Whittaker was born in a house on Aberford Road in Woodlesford in 1919. As the last child in the large family of Charles Henry and Ada Hobkinson she grew up being “spoilt” by her much older brothers. When she left school at the age of 14 she had a succession of jobs including making munitions during the Second World War. Elsie met Harry Whittaker while she was working at Woolworths in Leeds and they married at All Saints’ church on Boxing Day 1942. He was born and grew up in Hunslet and became a turner at Kitson’s locomotive works. After she was widowed, when Harry was just 35, Elsie had to bring up two young children on her own working for about 8 years as a dinner lady and teaching assistant at Woodlesford school. Elsie’s father was 48 when she was born and she remembers him working for the Sanitary Department of the Hunslet Rural District Council when she was growing up in the 1920s. Before that he had been an agent for the Pearl Insurance Company living with his family in a house close to the Pottery Lane railway bridge. As a young man he was a coal miner and in May 1892, at All Saints’ he married Ada Atack Langfield, the daughter of Thomas Langfield who was also a local miner. The ceremony was performed by the Reverend A.J.E. Irvin. Their first son, Henry, was born in July 1894 in a house on Stockings Lane, later renamed Highfield Lane. 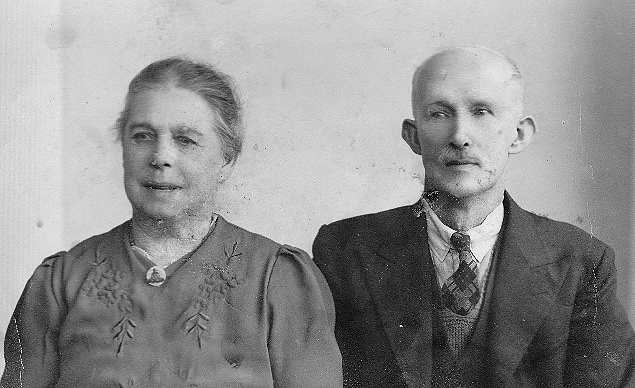 They celebrated their golden wedding at the church in 1942. Four years before his marriage a double tragedy had struck Charles Henry’s family, when his father, who was also called Henry, and who had become the lock keeper at Woodlesford, drowned in the lock in January 1888. 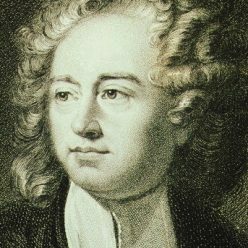 It happened just a day after his nephew had also fallen in and drowned in the canal a few yards away. Click here to read the full story. Henry Hobkinson, who was 58 when he died, was born at Killinghall, north of Harrogate. His father, Jonathan Hobkinson, was an agricultural labourer who moved to Lake Lock near Stanley and then to Altofts where he was a lock keeper on the canal. Henry became an engine driver and then, like his father, joined the Aire and Calder Navigation. He became a tug boat captain and was later the captain of a dredging boat. Before coming to Woodlesford lock he was the lock keeper at Fish Ponds lock about a mile to the west. After his death Henry’s wife, Jane, moved to Princess Street (now Church Street) where she took in lodgers who worked at the railway station. Charles Henry Hobkinson and his wife Ada Atack Hobkinson. The Hobkinson family were regular churchgoers, serving in the choir, as sidesmen, vergers, and on the parochial church council, a tradition which Elsie carried on with her family. For a time she was a leader of the local branch of the Girls’ Friendly Society organising weekly activities at the parish hall and trips further afield to places like Coventry Cathedral and the seaside. A highlight of Elsie’s childhood were regular visits to the nuns of the Community of St.Peter at their House of Mercy at Horbury, a convent which was also a school for “bad” girls. Elsie remembers taking part in Christmas plays there, and her brother, Frank, who had been a miner, was offered a job at the convent as a handyman and gardener through the good offices of the Woodlesford vicar Dan Ivor James. In 1932 Frank and his wife moved with some of the nuns to Laleham Abbey near Windsor where he stayed working for them for 37 years until his retirement. Another tragedy was to strike the family in February 1935 when Leonard Hobkinson’s wife, Mary, passed away after a long illness. They had married at Woodlesford in 1924 and she was only 33 when she died. She grew up at Long Preston near Hellifield and was the daughter of Herbert Wilson, an ironmonger’s traveller from Skipton. “Mr. Leonard Hobkinson asks me to convey his very grateful thanks to all those who have so ungrudgingly given their help during his wife’s illness.” After Mary’s death Leonard moved back in with his parents and Elsie helped bring up his two children. Click on the link below to listen to Elsie’s memories of growing up and living all her life in Woodlesford. She was 95 when she passed away in January 2015. 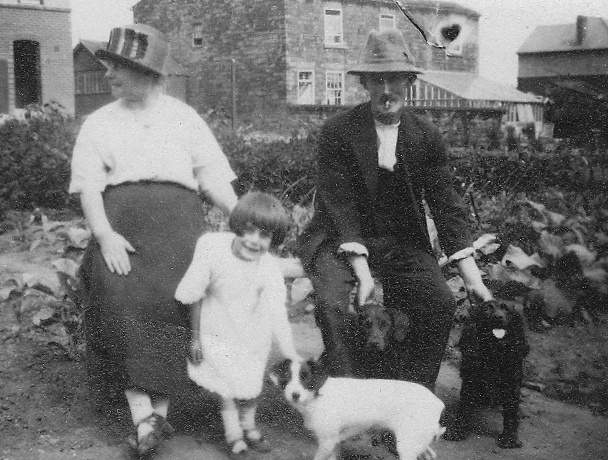 Elsie with her mum and dad on the family allotment on Holmsley Field Lane in about 1925. The stone house in the background was called Mount Pleasant. In 1911 it was the home of Sarah Ann Rhodes and her sister Emily who were milk dealers. Around the time of the Second World War one of the houses was occupied by Jim Rayfield who used to run excursions to the seaside in a small bus he owned. 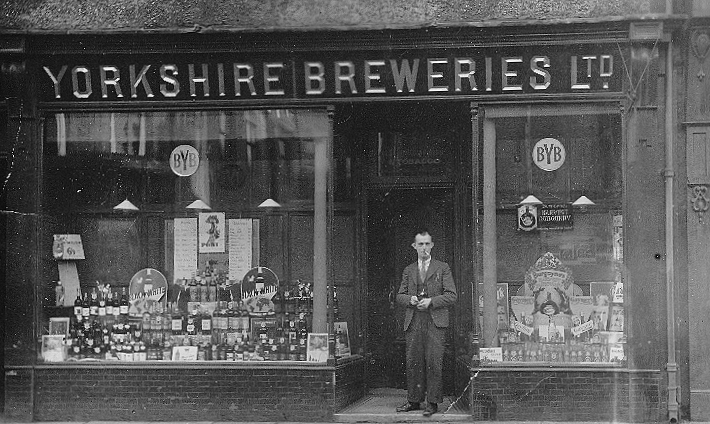 Elsie Whittaker’s eldest brother, Harry Hobkinson, rose to be the Chief Cashier at Bentley’s Yorkshire Breweries. This photo of him is believed to have been taken at the BYB shop on Newgate Street in Bishop Auckland, County Durham. He served in the army in the Middle East in the First World War. A cigarette case in his pocket saved his life when it caught the impact of a bullet. 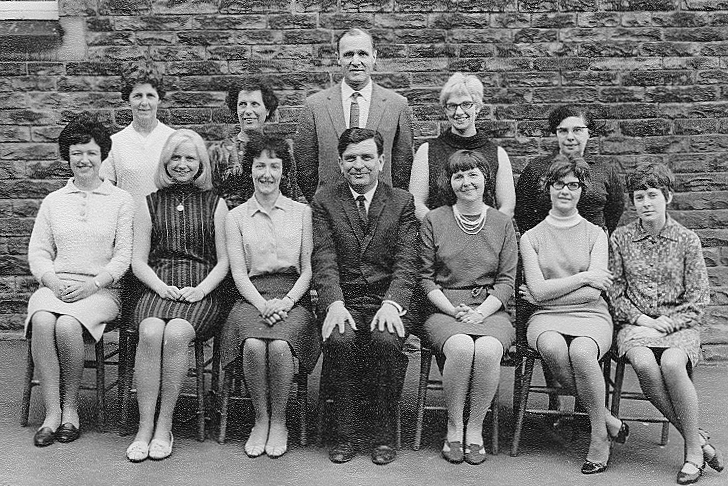 Teachers at Woodlesford School in the 1970s. Back row: Elsie Whittaker, Mrs. Harding, Mr. Brownlow, Mrs. Healey, Mrs. Knight nee Gilderdale. Front row: Mrs. Adcock, Mrs. Brown, Mrs. Denise Gray, Denis Darton (headmaster), Mrs. Jean Rowling, Mrs Margaret Cluderay, Miss Hesling.